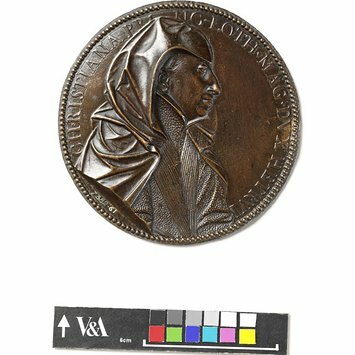 Cast in bronze or lead, the portrait medal commemorated individuals and often associated events. Many specialist sculptors from the Renaissance onwards were attracted to this small-scale art form. Inspired by Roman coins, with portraits of rulers on the obverse and allegorical representations on the reverse, medals were used as gifts and mementoes and eagerly collected. The medal format proved ideal for this type of personal and intimate object. Christine of Lorraine (1565–1636), daughter of Charles III of Lorraine, married Ferdinando I de’ Medici, Grand Duke of Tuscany, in 1589. She was widowed in 1609. 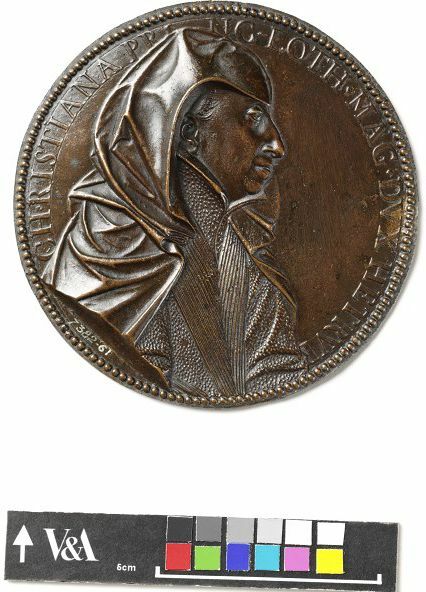 This formal portrait medal shows her wearing a widow's clothing, dominated by an extensive veil. 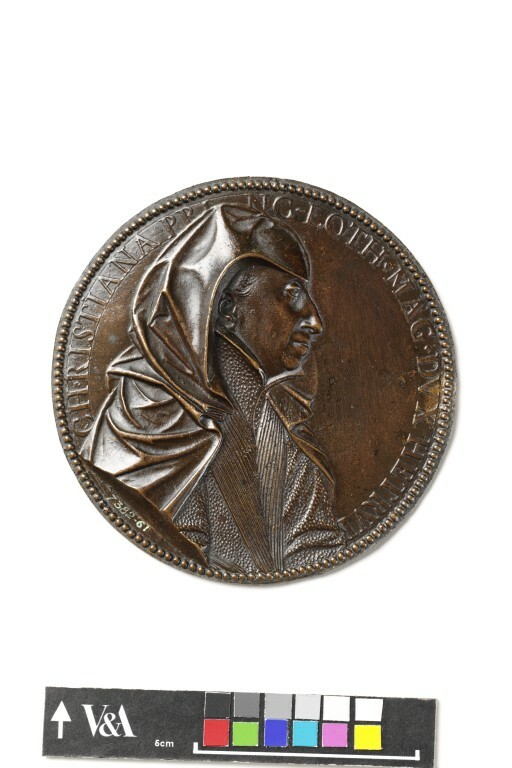 The commemorative portrait medal was especially highly regarded in France during the first half of the 17th century. Guillaume Dupré (1579-1644), court medallist to Henri IV and principal sculptor to the King, had a very successful career in France before being invited to Italy in 1612 by the new Duke of Mantua, Francesco IV. He travelled on to Florence the following year and produced medals of the Grand Duke of Tuscany, Cosimo II, his wife Maria Magdalena of Austria, and his widowed mother, Christine of Lorraine. Dupré's grasp of the Italian tradition, together with his considerable technical skills, enabled him to cast medals in a style that proved influential on succeeding generations of French medallists. Inventory of Art Objects Acquired in the Year 1861 In: Inventory of the Objects in the Art Division of the Museum at South Kensington, Arranged According to the Dates of their Acquisition. Vol I. London: Printed by George E. Eyre and William Spottiswoode for H.M.S.O., 1868, p.